I am a missionary sister in Central America. 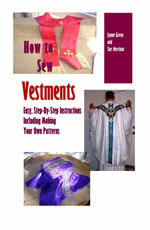 I would like to know what type of material is best in a very hot climate, and can it be used for a vestment. A wash and wear type cotton would be best, and preferably one that is unlined. We plan on having a washable polyester brocade for sale soon in the coming year. Right now the fabric is only available in bulk pieces of 25 yards each. You can see it here. Cost for the fabric is $9 per yard.